Home Function Finance How can finance teams benefit from Dynamics NAV 2018? Earlier this month saw the release of Microsoft Dynamics NAV 2018, but what does this mean for finance teams, who are heavy-users of ERP systems. In the latest of our Dynamics NAV 2018 blogs, we focus on the instant benefits that financial leaders and their colleagues will see. Within the Business Manager and Accountant role centres, there is a new option in the Excel Templates ribbon – users can choose pre-configured reports (balance sheet, income statement, cash-flow statement and more), that are ready to print from Microsoft Excel. If a user makes a mistake it is now easier to correct posted job related sales invoices based on planning lines of the Billable type. You can choose Cancel or Correct actions on the posted invoice and a credit memo is created. Job planning lines are also created automatically. Visual indications of mandatory G/L accounts that need to be set to cover most scenarios related to specific posting set up. This aids in compliance and ease of use. Users only see what they need to, for example if a user doesn’t have the payment discounts posting feature enabled, the payment discount G/L accounts won’t clutter their view while setting up general posting. Frustration is removed at time of posting, by functionality that notifies users when preparing a document that posting setup is missing. If there has been a rush on sales, and finance may struggle to keep up with processing – NAV 2018 can help by allowing batches of orders, invoices or credit memos to be processed in one go using the “Post Selected” feature below. By setting the relevant default transaction types for sales, purchases and returns; both preparation and intrastat reporting is made faster. Finance teams can use the Intrastat Checklist report to see a visual indication of which intrastat journal lines need correcting before submitting an intrastat report. Sometimes an additional fee or service isn’t in your item catalogue which causes frustration when preparing sales or purchase documents; finance users benefit from the ability to add these on their document lines and post the revenue to the correct general ledger account in Dynamics NAV 2018 from the document. Processing of data needs to be fast and accurate. With a “GetAddress.io UK Postcodes” extension plan (get the API key for a free trial for 30 days to check it out first if needed), users can find and input addresses for vendors, customers and contacts. Plus when setting up new companies, validation of VAT registration number can be carried out and also retrieve the correct name and address registered against the EC VAT VIES. By installing the QuickBooks Payroll File Import extension, users can import payroll transaction files in the QuickBooks IIF format. Aggregated payroll data will be imported to the General Ledger accounts according to your initial mapping criteria. This includes date, payroll account, description and amount. The system comes with a sample for users to try out functionality and get comfortable before mapping and importing. 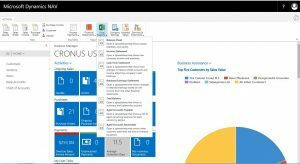 These are just some of the highlights of the functionality that Dynamics NAV 2018 brings to support finance teams in improving productivity, accuracy and ease of use. For more information and a tailored demonstration, please contact Prodware.